This study evaluated by standardised digitised periapical radiography the crestal bone maintenance around modified diameter internal hex implants with variable thread design and narrow neck loaded with different procedures. Forty implants were placed in 25 patients. Twenty implants were conventionally loaded, 20 ones immediately loaded. Radiographs were taken with a customised bite record and processed with software. Measurements of bone from the fixture–abutment junction to mesial and distal marginal bone levels were made. Student’s t test statistical analysis was adopted. 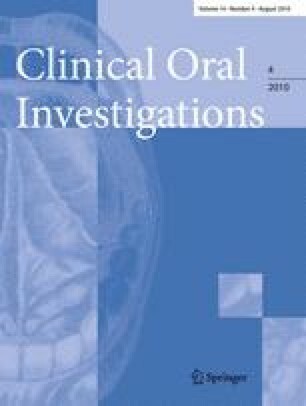 Baseline data were variable; at 1-year follow-up, there were no significant differences for marginal bone loss between immediately and conventionally loaded maxillary implants (p = 0.1031), whilst there were slight significant differences between immediately and conventionally loaded implants in the mandible (p = 0.0141). Crestal bone maintenance around conventionally and immediately loaded modified diameter implants was similar, with slight significant differences in mandible where a lower marginal bone loss was observed. The authors declare to not have conflict of interest.